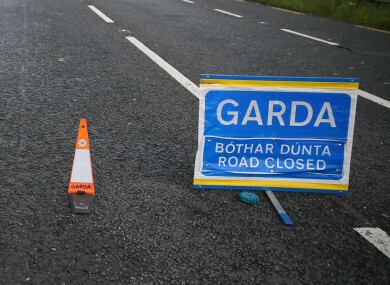 A MAN IN his 50s has been killed in a single-vehicle collision in Co Clare. Gardaí are investigating the circumstances that led to the incident, which happened at Castlefergus near Quin at around 9.15pm last night. The male driver was the only occupant of the car, and was pronounced dead at the scene, before he was removed to University Hospital Limerick for a post-mortem examination. It is understood from initial investigations that the man’s car collided with a wall. The road remains closed to allow Garda Forensic Collision Investigators to examine the scene, and the local coroner has been notified. Gardaí have appealed for witnesses to contact Ennis Garda Station on 065 6848106, the Garda confidential line on 1800 666 111 or any Garda Station. Email “Man (50s) killed in single-vehicle collision in Co Clare”. Feedback on “Man (50s) killed in single-vehicle collision in Co Clare”.